WASHINGTON, Oct. 22, 2012 – Officials from the Defense and Veterans Affairs departments participated in a panel discussion here Oct. 19 on efforts to prepare service members for the transition to civilian life. Danny Pummill, director of VA/DOD liaison for Veterans Affairs, and Susan S. Kelly, director of DOD’s Transition to Veterans Program Office, explained the new Transition Assistance Program during the 10th annual Military Reporters and Editors Conference. “This isn’t your death-by-PowerPoint TAP from the 1990s,” Pummill said, referring to a slide-intensive one-day seminar for transitioning service members in days gone by. “[The new TAP] is well planned and thought out. A number of pilot studies were conducted over the past year, Kelly said, including with the National Guard and reserves. The new TAP will feature pre-separation classes ranging from health care, life insurance and disability to higher education, vocational training and home loans, Kelly said, and other parts of the VOWS Act will be implemented in phases through 2014. By the end of 2013, Transition Goals-Plans-Success, known as GPS, will replace TAP, Kelly said. She explained that GPS is a classroom and one-on-one session with service members and their spouses to formulate a plan, including a detailed budget. The plan could be vocational training or college, she explained, in which case the service member would meet with a representative from that institution and begin the paperwork process. Service members wanting to start a business would meet with a representative from the Small Business Administration to go over the feasibility of their business plan and funding resources. For those wanting to enter the private or government sector workforce, she said, career planners would assist with resume writing and job searches, and meetings could be arranged with subject-matter experts in the targeted occupational fields. Service members also would have a “Plan B” in place in case something didn’t work out. Other aspects of the plan include meetings with counselors to focus on the social and psychological factors, which Kelly said are just as important to transitioning service members because they are used to living in a structured environment and need to be better prepared to be on their own. Kelly said special efforts are being made to reach out to Guard and reserve service members to ensure they are getting all the assistance they need. For those living far from military installations, she said, transition teams would be sent out, and some training that otherwise would take place in a classroom could be done in a “virtual classroom” setting. By the end of 2014, service members will prepare for transitioning “across their military life cycle,” Kelly said. In other words, training programs with timetables will be formally instituted as soon as a service member enters the military. 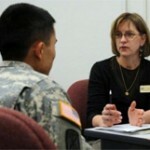 “In addition to being ‘military ready,’ they will now be ‘career ready,'” she added. The transition effort established by the VOW Act is a joint effort of the Defense Labor, VA, and Education departments, along with the Small Business Administration, the Office of Personnel Management and the White House Domestic Policy Council. “If someone told me six government agencies would come up with a plan, I wouldn’t have believed it would work,” said Pummill, who served in the Army for 34 years. “I’ve been meeting with them for a year now, and we’re working things through. “It’s a model for how government agencies can get together and share manpower and resources and do the right thing, in this case for service member, and this is best plan possible to take care of our service members,” he added.